Credit: Image from Axel Springer Academy. The ScopeBerlin team went live for the first time on Monday, 6 June, at 6 o'clock in the morning. The plan is to livestream one story every hour until Sunday, 12 June, in a 24/7 livestreaming project on Facebook Live and Periscope aiming to find out what type of local stories work best in this emerging medium for news. "We tried to figure out a new way to transfer local journalism into the livestreaming world, thinking about a concept that is applicable to other cities as well, to cities that never sleep," said Kristin Schulze, project lead and director of crossmedia at Axel Springer Academy, Axel Springer's school of journalism. "For us, the only good way to report on a story like this is to do it live, because you are right in the middle of the situation, there is no repeating, there is no editing, it's a really new and fun way to report on a city." Image from Axel Springer Academy. 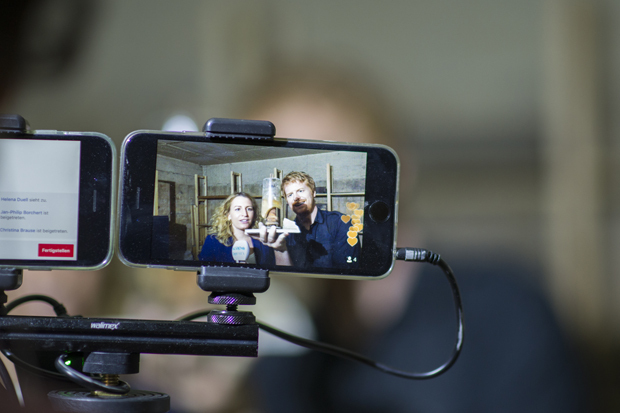 ScopeBerlin livestreams on Facebook Live and Periscope using two smartphones placed side-by-side on a mount. Facebook is where the majority of its intended audience watches the videos, a mix of Berliners and tourists between 18 and 35 years old. While live streams have more views during the broadcast on Periscope rather than Facebook, the total viewcount on Facebook is higher as the videos remain in the feed for longer. Facebook is also the platform the team has had to focus on more for community engagement and comment moderation – Schulze told Journalism.co.uk ScopeBerlin has already had to deal with hate speech in the comments. A live stream following a reporter dressed in a Burkini and the reactions of those around her proved challenging, as the social media team had to draw the line between which comments needed to be hidden and which ones could remain on the page as they contributed to a discussion – which had to be heavily moderated as well. Each live stream from ScopeBerlin is produced by two student reporters from Axel Springer Academy's team of 16 journalists working on the project. A social media team is also online round the clock to moderate the engagement. Schulze explained the planning for the project started five weeks in advance, as every story has to be researched and scripted in order to prevent losing control of the stream while going live on Facebook and Periscope. The team produces three repeating shows each day: a morning digest, a lunchtime look at the trending topics of the day, and an evening briefing highlighting streams to look out for during the night. Vox pops are also part of the mix, and this type of live stream usually involves three reporters: one in front of the camera, one filming, and one lining up the people who have agreed to take part. The project has already posed some technical challenges for the team. "There's no repeating of the scene, there is no editing, there is no taking out of a person because this is happening live. You need to think about every picture, every second of what can happen in your story." Checking the internet connectivity and the light on location in advance is also important, as well as planning the shots and testing the kit. The team uses the iPhone 6S to film, and microphones are a key part of the kit. Aside from ensuring audio quality, microphones offer an opportunity to brand a stream, explained Schulze, enabling viewers to identify the creators more easily when the videos start playing in their feed. ScopeBerlin is also publishing a small number of pre-recorded videos in situations where livestreaming would be impossible – the team plans a series of 360-degree videos from "lost places" in Berlin, which are not supported live. "We already learned a lot when it comes to the technical side, the quality standard every journalist has to go with when it comes to Facebook Live and making journalism more fun to watch for our audience." Throughout the week, the team will be testing additional kit and ways of dealing with more difficult streaming conditions, such a low light. Schulze is keen on the format as a promising medium for journalism, but points out reporters using live streams have to differentiate themselves from members of the public going live on Facebook through the quality of the streams. "People are so interested in Facebook Live because you cannot fake anything, you cannot repeat anything. "This puts a lot of pressure on the reporters. They need to perform each and every minute in front of their streams. "I think Facebook Live will probably be very important for the future of journalism and it will be professionalised. This is just the beginning and we want to be part of it."